The Atlantic hurricane season runs from June 1 to November 30. What is a hurricane? A hurricane is an enormous storm that moves towards land in the Western Hemisphere with sustained wind speeds of over 74 mph. While hurricane strengths and totals vary from year to year, hurricanes can be extremely destructive forces of nature with high winds, heavy rains, and storm surge. When a hurricane approaches your business, having a meteorologist on-call can give you peace of mind and help you make the right operational decisions. While hurricanes can be scary, damaging, and even deadly, you should always heed the warnings of local officials and keep a positive attitude. 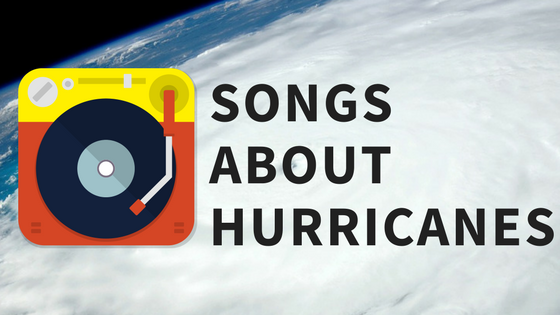 There are plenty of songs about hurricanes that are perfect listening for hurricane season. Let’s take a look! Here’s a small selection of our Spotify playlist. The stormy intro and rain-like piano notes of “Riders on the Storm,” Make it a perfect first track to this playlist. This jam, the last song Doors frontman Jim Morrison ever recorded, will help you think about the outer bands of hurricanes that often contain lighting, thunder, and heavy rains. We lighten things up a bit with the second song on our list. Scorpions’ “Rock You Like a Hurricane,” is a high-powered rock song that helps remind us of the power of hurricanes. They often rock areas like the Caribbean, East Coast, and Gulf Coasts with dangerous conditions. The third song on our playlist is from the hit Broadway musical, Hamilton. In this song, the main character, Alexander Hamilton, compares the natural disaster of a hurricane on his home island to the disaster of a situation he is in during the musical. In the eye of the hurricane, there is definitely quiet, but it’s still not safe! The next song on our list is perfect for riding out a storm in a safe shelter. It’s one of those songs that makes you relax, although you definitely don’t want to get caught in the rain when it’s accompanied by hurricane force winds! One of the most dangerous conditions of hurricanes is storm surge. Storm surge is when the sea rises to higher than average levels because of the pressure of the storm and winds. We chose this next song, “The Tide is High,” to remind ourselves of storm surge and the flooding it can cause. We chose this next song, “Thunderstruck,” because thunder and lightning are two very present severe weather conditions during most hurricanes. Our lightning detection system alerts us to thousands of lightning strikes during hurricanes. This next song features, arguably, some of Neil Young’s greatest guitar work. “You are like a hurricane/There’s calm in your eyes.” The eye of a hurricane is calm, but is surrounded by the eyewall. The eyewall contains the system’s strongest winds. We must preface this next song by telling you it’s never safe to go surfing in a hurricane! However, we couldn’t go through this playlist and not include a Jimmy Buffet song since there are so many Margaritaville’s in areas often hit by hurricanes. Have you ever seen the rain if you’ve never seen the rain of a hurricane? This next song is a classic by Creedence Clearwater Revival that deserves a spot on any stormy weather playlist. And after the storm, this calm song by Mumford & Sons will help relax you. After a hurricane, it is important to stay in shelter into local authorities deem it safe to venture outdoors. Storm surge is often the worst after the eye passes and flooding is difficult to see at night. Not to mention, flood waters often contain dangers like live wires, flash flood rapids, and dangerous wildlife. Stay put until you know it’s safe and start to rebuild. And that’s our list of songs about hurricanes! Do you know some songs about hurricanes that we forgot? Please add your additions in the comments section below. That way, we can add the songs to our playlist on Spotify. 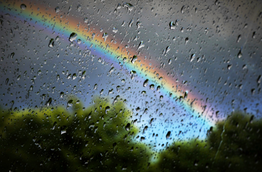 Don’t forget to subscribe to our blog to get a new weather-themed playlist on Monday’s. I didn’t realize that there were so many songs called ‘Hurricane’ . That particular song has a detailed description of the before, during and after conditions of a hurricane. Thanks, Cal! There are so many differents songs called “Hurricane” we had a hard time choosing which ones to include. We’ll add it to our Spotify playlist. Thanks again!